As a general rule, Christmas themed films tend to be a dime a dozen around this time of year. They're a cheap, safe sell for studios looking to make a quick buck around the holiday season. If there is anything that Arnaud Desplechin's well liked French import A Christmas Tale is not, it's a cheap, safe sell. Unfortunately, it's not a very good film either. I know I'm in the minority on this one. The film is currently sitting pretty with a Metacritic score of 84, and a 90% positive rating at Rotten Tomatoes. But as much as I wanted to like it, I just couldn't. Desplechin's scattershot, mish-mashed narrative about a dysfunctional family (is there any other kind in the movies?) getting together to settle their differences one Christmas after it is discovered that the family matriarch, Junon (the regal Catherine Deneuve) is dying of cancer. Simple enough so far. In fact it's pretty un-extraordinary. But there's plenty of room for this tried and true formula to be shaken up a bit. Alas, it is not to be. This family, you see, has so many issues, hang-ups, and quirks that are all so ridiculously simple that it's just hard to care. The oldest, Elizabeth (Anne Cosigny), has lived with the responsibility of becoming the oldest after the untimely death of her older brother from a rare blood cancer when he was six years old, and has taken her hatred out on the middle child, Henri (Mathieu Amalric). Henri is the estranged black sheep of the family, a selfish, obnoxious alcoholic who openly claims to not love his mother, and she does the same for him. And Ivan (Melvil Poupaud) is the youngest, who was conceived so that his dying older brother may have one more chance at finding a compatible donor, but to no avail. I could go own listing their problems and the problems of their spouses and children, but that would take far too long. The real issue is that Junon need a bone marrow transplant if she has any hope of survival. But her type is extremely rare, and after the entire family is tested it is discovered that the only two compatible donors are Henri and Elizabeth's mentally troubled son Paull (Emile Berling). This opens up a whole new set of wounds for the family, and Junon mulls over whose marrow to accept, and the family spends the holiday warring over old grudges and petty, pointless rivalries. If there are any two words that could sum up how I felt about A Christmas Tale, it would be petty and pointless. Or long and dull. Or some combination thereof. It is a film about petty, hateful people and their petty, hateful problems. Desplechin never gives us a reason to care about anything in the film. It's like The Royal Tenenbaums without the humor and personality. 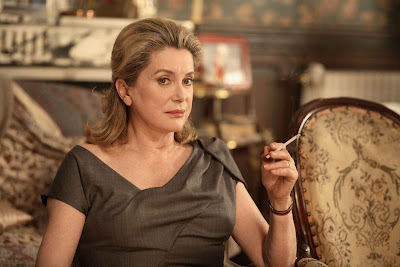 Catherine Deneuve, for her part, is luminous as always. But the entire film feels cold and distant, and fatally unfocused. It is similar in theme to Jonathan Demme's Rachel Getting Married, but far less successful in its aims. That film was downright unpleasant in places, but Demme managed to nail what Desplechin never finds, the heart of his characters. Instead we are treated to a meandering, aimless, pretentious, overlong chore of a film that fails to offer any real insight into the troubles of this miserable group of people. Two and a half hours with a family never felt so long. 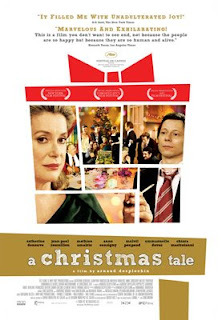 A CHRISTMAS TALE; Directed by Arnaud Desplechin; Stars Catherine Deneuve, Jean-Paul Roussillon, Anne Cosigny, Mathieu Amalric, Melvil Poupaud, Hippolyte Girardot, Emmanuelle Devos, Chiara Mastroianni, Laurent Capelluto, Emile Berling; Not Rated; In French w/English subtitles. It's funny, though my opinion is in line with the critics I feel like the one in the minority because you're the latest in a line of acquaintances who just didn't care for it. I'll have to go back and look at my notes and see what really grabbed me about it because now I'm having second thoughts. I just really liked how it took the fairly stock cliche you mentioned (dysfunctional family holiday) and spun it in fresh and exhuberant directions. The film was never quite what I was expecting it was going to be and in this case that's a good thing. I wasn't counting on the abundant humor either.